Eviction drove Terrel Askew’s family from their West Baltimore home when he was seven. Over the next few years, they moved 11 more times. As Askew tells it, the landlord had a $5,000 water bill on their Fulton Avenue building and the tenants, even the ones like his family who did not have big bill problems, were thrown out. 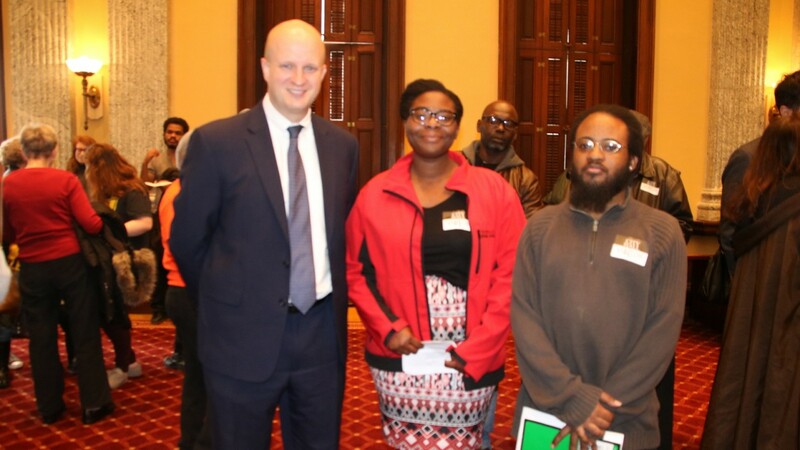 That hard history was on his mind as he and other community activists were at City Hall yesterday to celebrate a major milestone: The introduction of legislation to pump $20 million into the city’s created-but-never-funded Affordable Housing Trust Fund. “There are vacants in my community that have been around longer than I’ve been alive,” said Destiny Watford, a Curtis Bay resident who is working with the Greater Baybrook Community Land Trust. Bill 18-0221, introduced by Councilman John T. Bullock, has unanimous support from the Council and the blessing of Council President Bernard C. “Jack” Young. It would increase the city’s 1.5% transfer tax to 2.1% and the recordation tax from 1% to 1.4%. The increases would apply only to sales of rental property, not property meant to be owner-occupied. Councilman John Bullock, with President Jack Young and other Council members, discuss legislation to fund affordable housing through a transfer tax increase. The coalition group, Housing for All: Baltimore, estimates that the $20 million could fund the rehabilitation of 400 vacant houses a year and employ 1,000 people to do the work. 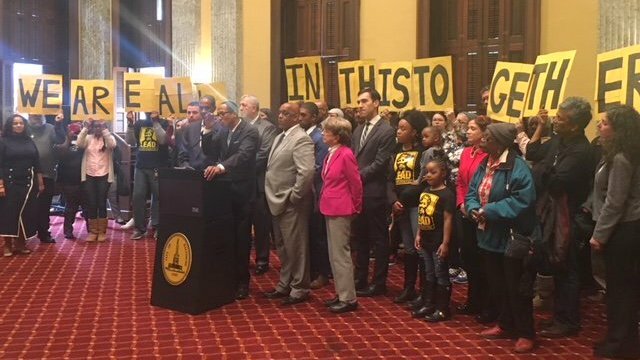 “We don’t really have the time to wait, given the vacant housing in Baltimore, the blighted neighborhoods and the unaffordability as it relates to housing,” Bullock said at a press event to promote the legislation. Advocates say residents already have been waiting too long given the history of the Trust Fund. And uncertainty about Mayor Catherine Pugh’s support for the measure makes it unclear how much longer the wait will continue. Pugh’s spokesman has not responded to a query about her position from The Brew. Baltimore’s Affordable Housing Trust Fund, approved by voters in November 2016, amended the city charter to create a fund to develop and maintain housing that low-income residents can afford. Henry’s bill, 17-0173, included owner-occupied property sales, while Bullock’s gains broader support on the Council by exempting them. (To make up the difference, Bullock’s bill more than doubles the amount of the increase on non-owner-occupied property transactions. Housing advocates crafted their own proposal, the 20/20 Plan, which calls for the city to float $20 million in bonds to create affordable housing and another $20 million to “deconstruct” vacant rowhouses. The 20/20 concept received Pugh’s pledge of support as a mayoral candidate – and again at a rally last year. But she still has not acted on her promises in January, when activists confronted Housing Commissioner Michael Braverman over a capital budget that fell far short of their affordable housing funding goals. Coalition members said they were encouraged by a subsequent meeting with Braverman – who informed them of a $2 million one-time affordable housing allocation the mayor approved in FY19. But they said they are still waiting to hear from Pugh on the Trust Fund and 20/20. “We’ve just got to demonstrate to the mayor how important this is,” Askew said. In Curtis Bay, that urgency is on display every day in the form of the burned and vacant remains of 10 houses consumed by a fire a year ago, said Greg Sawtell of United Workers. “The fire started in a vacant. It displaced 23 residents,” he said, describing residents’ dream scenario – for help with rebuilding that would allow equitable redevelopment to take its place. As the properties languish, residents are looking to the city to help put the housing into receivership, “but code enforcement isn’t being utilized to break that deadlock,” Sawtell said. Before development pressure from Port Covington and other waterfront areas displaces people of modest means, he said, residents need to take control of their community’s fate. “We’re at a really critical juncture,” he said.